Download "Information Pack. 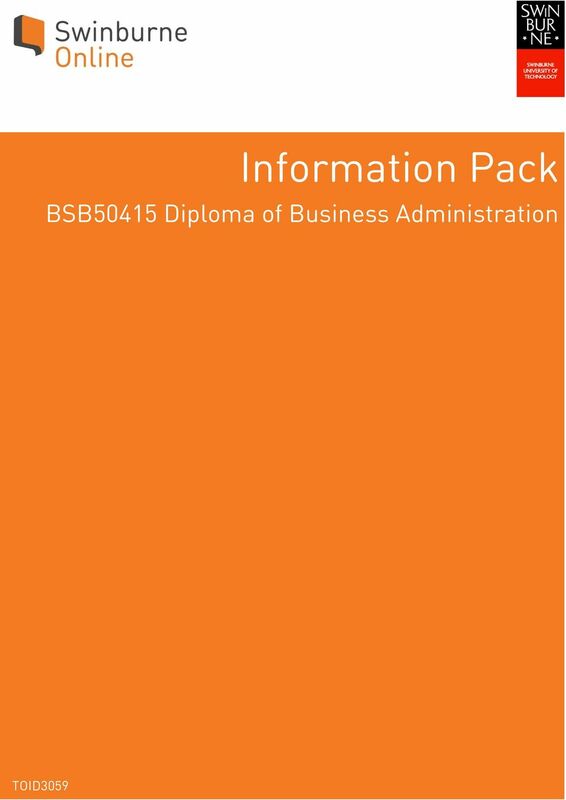 BSB50415 Diploma of Business Administration TOID3059"
2 Swinburne Online Information Pack (BSB50415 Diploma of Business Administration) Welcome to Swinburne Online! Before you submit your application, we want to make sure that you are completely aware of how your course will be delivered and what is required from you as an online student. Please read through this pack carefully. If you have any questions, your Course Consultant can provide additional information. 3 About your course You have chosen to enrol in the BSB50415 Diploma of Business Administration. This course will be delivered online with Swinburne Online. This Diploma is nationally accredited with the Australian Skills Quality Authority (ASQA) and recognised by Registered Training Organisations (RTO) and Universities across Australia. Your study will be delivered via MyQuest. MyQuest is the online community where you will manage your course, receive study support from trainers, and connect with other students via live chat and discussion boards. It will be the hub of your learning experience while you study with Swinburne Online. 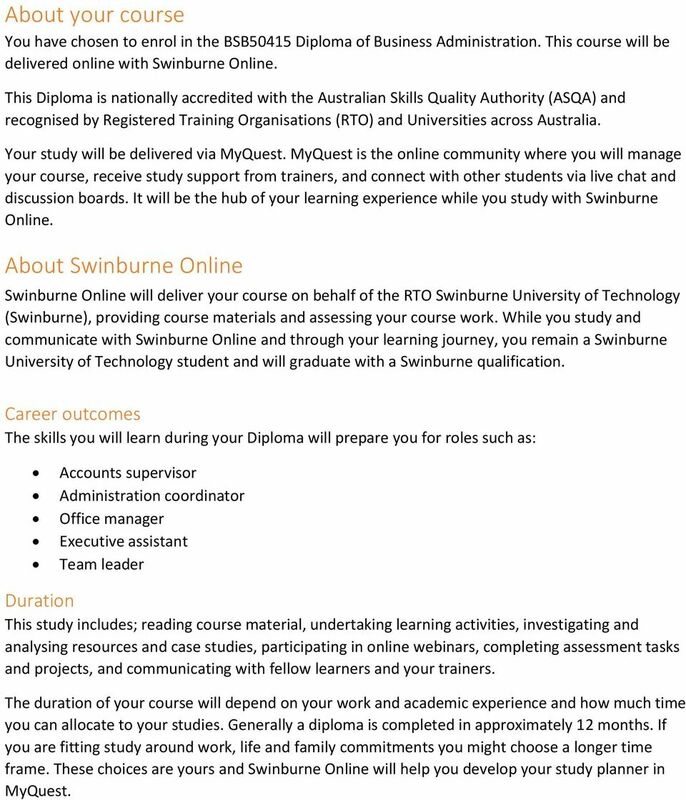 About Swinburne Online Swinburne Online will deliver your course on behalf of the RTO Swinburne University of Technology (Swinburne), providing course materials and assessing your course work. While you study and communicate with Swinburne Online and through your learning journey, you remain a Swinburne University of Technology student and will graduate with a Swinburne qualification. Career outcomes The skills you will learn during your Diploma will prepare you for roles such as: Accounts supervisor Administration coordinator Office manager Executive assistant Team leader Duration This study includes; reading course material, undertaking learning activities, investigating and analysing resources and case studies, participating in online webinars, completing assessment tasks and projects, and communicating with fellow learners and your trainers. The duration of your course will depend on your work and academic experience and how much time you can allocate to your studies. Generally a diploma is completed in approximately 12 months. If you are fitting study around work, life and family commitments you might choose a longer time frame. 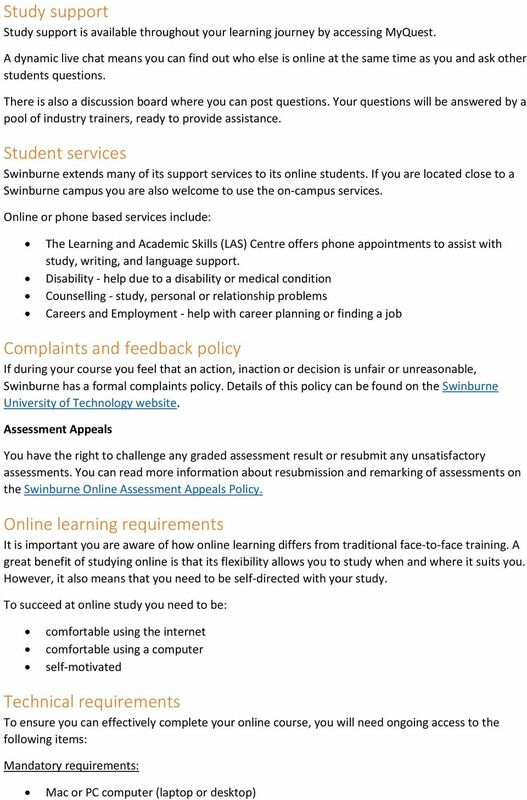 These choices are yours and Swinburne Online will help you develop your study planner in MyQuest. 8 Be honest and respectful in all your communications and interactions with fellow students, Trainers and Assessors Demonstrate professional behaviour while undertaking work placements, projects or fieldwork, and respect the privacy of the client and any commercial information made available Fees For 2015 the total fee for your BSB50415 Diploma of Business Administration is $6,600. This fee is inclusive of all learning materials, trainer support, assessment, and administration and support services. Payment You can pay your fees in the following ways: Upfront payment via BPAY or credit card Deferred payment via VET FEE-HELP Once you enrol you will receive information on how to pay. To begin your studies and access MyQuest your payment must be processed. 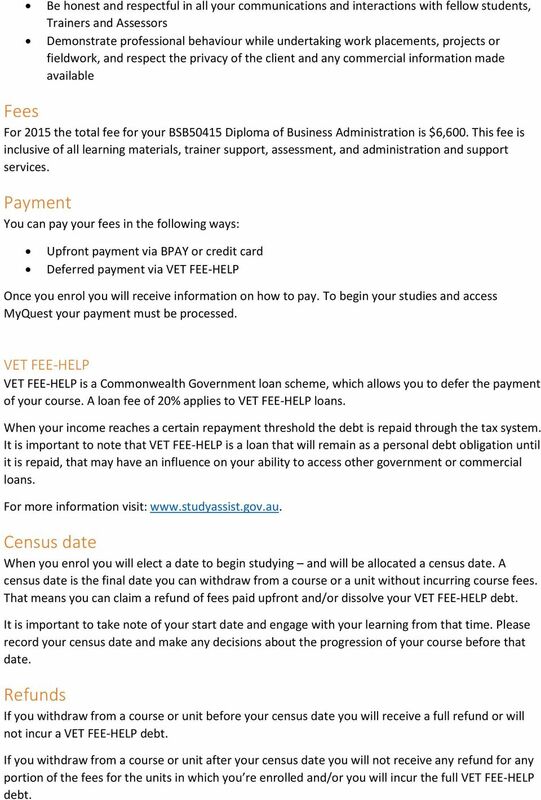 VET FEE-HELP VET FEE-HELP is a Commonwealth Government loan scheme, which allows you to defer the payment of your course. A loan fee of 20% applies to VET FEE-HELP loans. When your income reaches a certain repayment threshold the debt is repaid through the tax system. It is important to note that VET FEE-HELP is a loan that will remain as a personal debt obligation until it is repaid, that may have an influence on your ability to access other government or commercial loans. For more information visit: Census date When you enrol you will elect a date to begin studying and will be allocated a census date. A census date is the final date you can withdraw from a course or a unit without incurring course fees. That means you can claim a refund of fees paid upfront and/or dissolve your VET FEE-HELP debt. It is important to take note of your start date and engage with your learning from that time. Please record your census date and make any decisions about the progression of your course before that date. Refunds If you withdraw from a course or unit before your census date you will receive a full refund or will not incur a VET FEE-HELP debt. 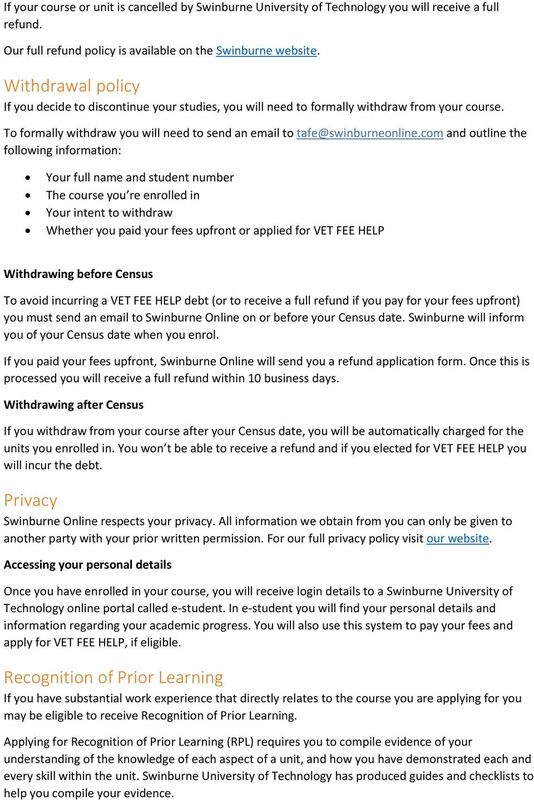 If you withdraw from a course or unit after your census date you will not receive any refund for any portion of the fees for the units in which you re enrolled and/or you will incur the full VET FEE-HELP debt. 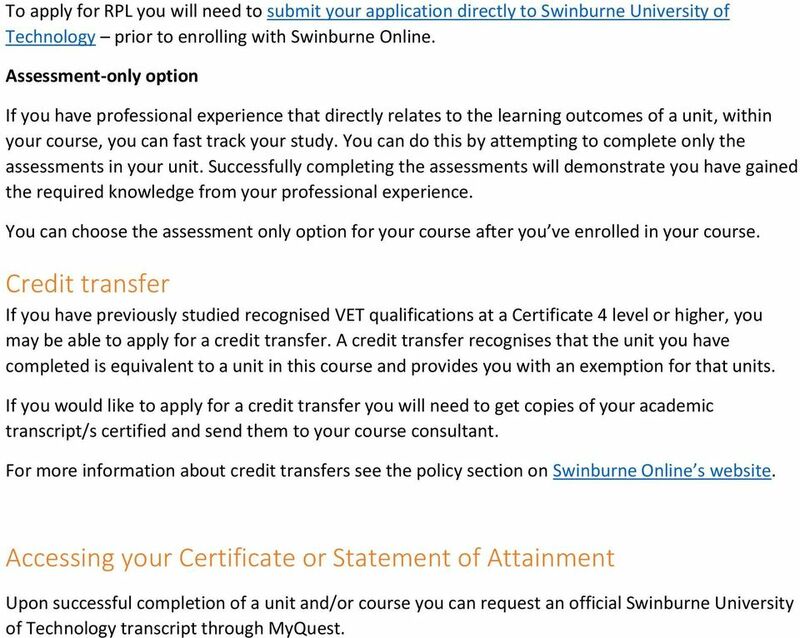 10 To apply for RPL you will need to submit your application directly to Swinburne University of Technology prior to enrolling with Swinburne Online. Assessment-only option If you have professional experience that directly relates to the learning outcomes of a unit, within your course, you can fast track your study. You can do this by attempting to complete only the assessments in your unit. Successfully completing the assessments will demonstrate you have gained the required knowledge from your professional experience. You can choose the assessment only option for your course after you ve enrolled in your course. Credit transfer If you have previously studied recognised VET qualifications at a Certificate 4 level or higher, you may be able to apply for a credit transfer. A credit transfer recognises that the unit you have completed is equivalent to a unit in this course and provides you with an exemption for that units. If you would like to apply for a credit transfer you will need to get copies of your academic transcript/s certified and send them to your course consultant. For more information about credit transfers see the policy section on Swinburne Online s website. 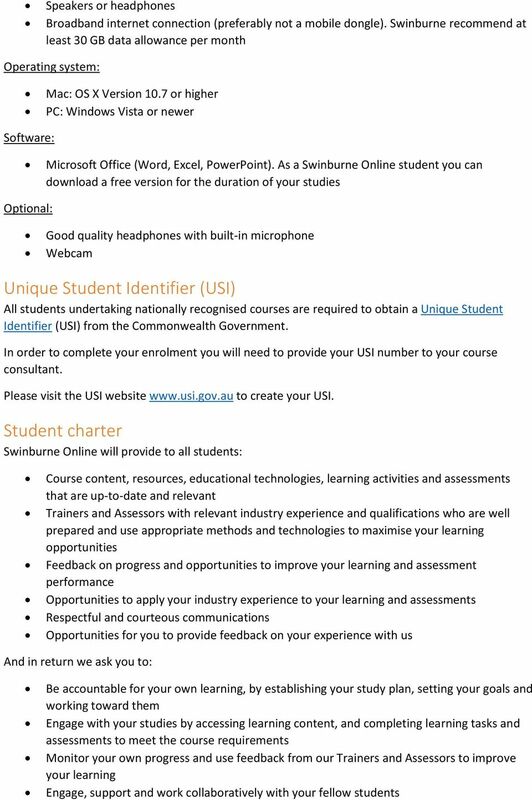 Accessing your Certificate or Statement of Attainment Upon successful completion of a unit and/or course you can request an official Swinburne University of Technology transcript through MyQuest. 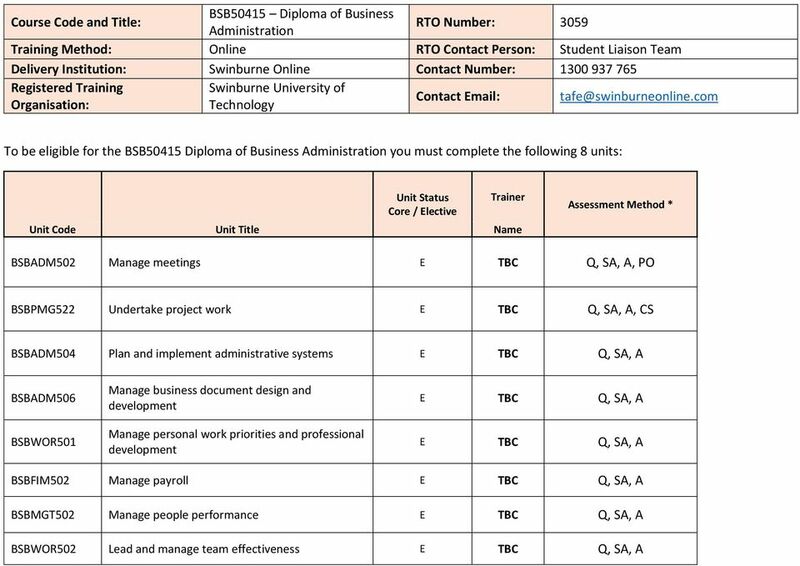 Course Outline BSB50415 Diploma of Business Administration Why Health Industry Training Health Industry Training is passionate and committed to inspiring students to achieve their career goals and aspirations. BSB50215 Diploma of Business Dear Students, Welcome to My Time Learning The Phoenix Institute trading as My Time Learning, is an exclusively dedicated to provide delivery and support to our Online Students. Business Top End Darwin Waterfront (Mixed Mode) BSB51415 Diploma of Project Management DESCRIPTION This qualification reflects the role of individuals who apply project management skills and knowledge. BSB51107 Diploma of Management. Improve your career prospects. Career outcomes. Study now Pay later. Leading Online College. Course Outline BSB51413 Diploma of Project Management Why Health Industry Training Health Industry Training is passionate and committed to inspiring students to achieve their career goals and aspirations. VET IN SCHOOLS. Pre-Enrolment Student Handbook 2014-2015 RTO ID: 40070 MASTER PLUMBERS ASSOCIATION OF SOUTH AUSTRALIA INC.
Advance Diploma of Management. Behind any GREAT service exist GREAT professionals who value quality, originality, and positive thinking. The Mental Health Coordinating Council (MHCC) acknowledges the traditional custodians of the land. PUA60112 Advanced Diploma of Public Safety (Emergency Management) Ver 1.0 Page 1 Introduction is a Registered Training Organisation (RTO number 41002) registered with the Australian Skills Quality Authority.